The Royal Borough of Kensington and Chelsea is a London borough, west of central London. Notting Hill is in North Kensington. 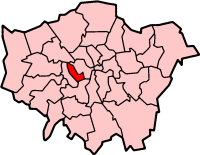 The borough includes several districts in the west of London; before 1965 the two boroughs of Kensington and Chelsea were separately administered. This page was last changed on 2 August 2016, at 07:04.